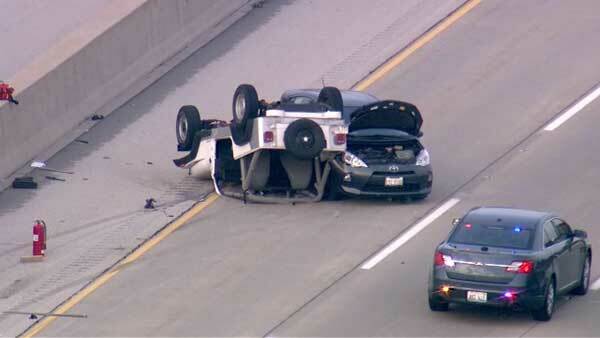 At least one person was killed in a rollover crash on westbound I-88 near Route 31 in southwest suburban Aurora. AURORA, Ill. (WLS) -- One person was killed in a rollover crash on westbound I-88 near Route 31 in southwest suburban Aurora. Illinois State Police say a 1991 Jeep, driven by 65-year-old Walter Smith, was traveling in the center westbound lane when it struck a 2012 Toyota Prius around 7:30 a.m. Wednesday while changing lanes. The incident caused the Jeep to flip over, ejecting Smith. Police say he was not wearing a seat belt and was pronounced dead at the scene. The two left lanes of westbound I-88 were closed Wednesday morning while crews worked to clear the scene. Officials are continuing to investigate.